Are Weight Machines THAT Bad?! Are Weight Machines THAT Bad?! My first job ever in fitness was at a Bally’s in Mesa, Arizona. I was around 18 and I had just become a newly certified trainer and was scared beyond belief! I never wrote a fitness program for anyone, never had to convince people to get personal training, never had to motivate people who weren’t athletes, to train! Fortunately, my introduction was to take new gym sign-ups and take them through our weight machines circuit. From a gym perspective they wanted to give the feeling that we cared about people and gave them SOMETHING to get on their training path. The weight machines were not intimidating to most and took up the most room in the gym. They were tools that most people thought they could use and that is definitely a big reason for commercial gyms to have them in their facilities. It was about that time though that this idea of functional training was gaining steam. I went on a pretty good break down about what REALLY is functional training the other day so you can check it out HERE. In discussing functional training though, I mentioned there is a solid group of fitness pros that don’t want our industry to evolve and honestly, want us to do everything. Before I go down the issues with such a path, let me tell you what happened to me at my first gym job. As I learned the limitations the weight machine circuit had for people, the more disenchanted I became and I felt almost dishonest showing people the weight machines. What is the big deal? Am I trying to tell you that weight machines don’t “work”?! Like my post on functional training, we can only answer this question if we try to delve deeper into what it means that something “works”. Can machines train a muscle? Yes. Can weight machines make that muscle stronger, yes. So, what is my problem?! This is much of the argument I read about a recent article (probably opinion piece is more accurate) discussing weight machines and their value made its way around the internet. Part of the argument was that weight machines have been used with the elderly to improve their every day activity performance. Really? No kidding. The problem with referencing a study like this comes in the fact that there are two major issues. One, taking a population with little to no strength training experience and giving them something will more than likely create an improvement. Sorry, this is the reality. Second, comes in the length of the study. Most studies like this are 8-12 weeks in nature. We know neurological changes in strength happen first and take the first 4-6 weeks easily, if not longer. That muscular changes don’t happen till more like 6-8 weeks at all. My point is that if you wanted a really good study on weight machines and functional training you would have to take trained groups in both arenas and have a performance standard not related to the lifts and have them go for at least a year. THAT would be cool, but probably impractical. Most people don’t realize the first changes people experience in the gym are largely neurological. That knowledge actually makes functional training even MORE important. We aren’t JUST training muscles! Where does my argument against weight machines come from though? Is it because I want you only to do Ultimate Sandbags? 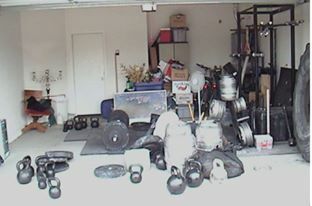 Of course I believe Ultimate Sandbags are a much better option, but you can see well before I had designed our Ultimate Sandbags I’d rather train in my garage in Arizona than at the big commercial gyms STOCKED with weight machines. WHY?! In the late 90’s I was learning functional training from people like Paul Chek. In fact, it was an article like this (this was a later one, check out the date on it HERE) where my mind shifted in why functional training was important for the health, not just muscle, strength, or looks of my clients. -Over-use of any given pattern of movement, regardless of freedom of joint motion. There are some real issues in looking to work predominately with weight machines. Of course though the supporters will say it isn’t an “either/or scenario”. In order to fix the limitations of the weight machines, why not ALSO do free weights. THEN you have the best of both worlds right? Maybe, just maybe that would work, but we have to ask ourselves these questions…. -Do I have unlimited time? -Do I have unlimited energy? -Is there a way to do the same thing but get a better result? These questions are important, because what machine proponents are really saying is yes to the first two and they rarely think of the last one. Listen, if you use a machine, heck, a circuit of machines, will you die? No!!! Will you get ZERO result? Unlikely, but most people come to us because they are looking for better. I mean a better way to use the limited time they have, how to use the limited energy they possess, to help them lose 30 pounds, but also help with their achy backs, shoulder, and/or knees. In other words, to me it isn’t a question of “can something work”, but rather can something work BETTER! If our decisions start getting based on what you WANT to use then using weight machines is fine. However, that isn’t why I get called. People want to talk to me because they want the best results possible and that takes having a plan, understanding, and system of functional training that works for you and doesn’t try to squeeze you into the program. THAT is what DVRT is all about! 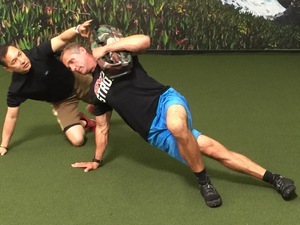 DVRT Master, Sean Lettero, shows you how much fun, dynamic, and effective true functional fitness can be for your training goals. THIS is what we teach at our upcoming DVRT educational programs coming to Seattle, Boston, and New York HERE. Can’t make it? Check out our DVRT Online education for 30% off for a VERY limited time with coupon code “july” HERE.